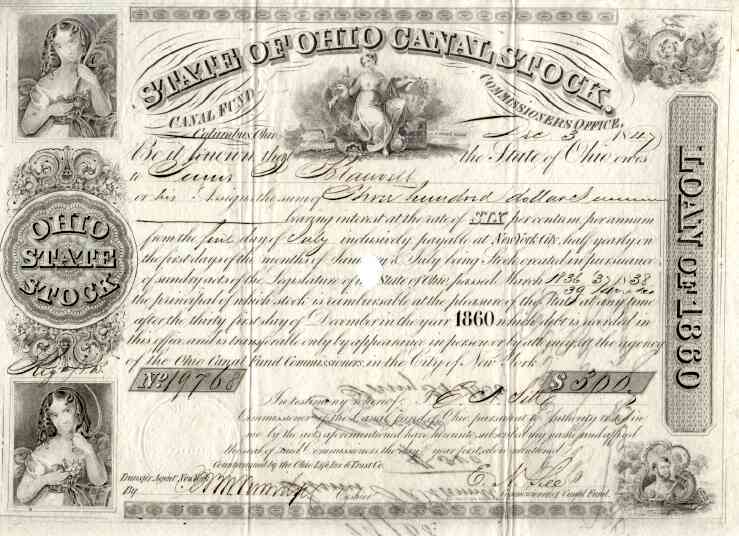 1847 State of Ohio Canal Stock Certificate. Actually a debt financial instrument, often called a stock in mid ninteenth century. Attractive early Ohio canal scripophily document with five vignettes. These state bonds were used to finance construction and maintenance of the Ohio & Erie Canal and the Miami & Erie Canal. These large construction projects eventually cost $41 million, nearly bankrupting the state of Ohio. Certificate is in VF+ condition with small diamond punch cancel in center of certificate.